What Should an Operator Consider When the Temperatures Drop? 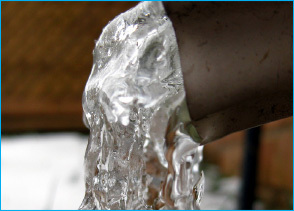 Cold temperatures can be a major problem for water operators and managers. In winter months, service lines and mains are highly vulnerable to extreme cold and therefore keeping lines from freezing should be at the forefront of every good manager’s mind. Keeping customers aware of best practices and understanding what resources an operator has available if mains and lines should freeze and break, can reduce stress in the moment. Always having a reliable and proven plan for addressing the unexpected is what can separate a good manager from a great manager. The weather is uncontrollable and completely unpredictable, making it very important to know what support services are available in your area should the worst happen. Being prepared for the worst case scenario, puts any manager a step ahead and provides customers with the level of service they need and deserve. A few years back during a particularly cold winter, region manager Dennis White prepared this basic primer as a guideline to help all of his people navigate the problems any operator can face in dealing with the prevention and repair of frozen pipes. He also put forward some very useful thoughts on how the water service provider may best assist in easing the costs associated with dealing with these problems. If a water service line customer is concerned about their water service line freezing, one of the best things the customer can do is check the temperature of the water at their faucet and if the temperature ranges between 38 to 40 degrees they need to let the water run. This can be a small stream of water, about a 1/8″ to ¼” width of the stream or about the size of a pencil. The flow will help reduce the chance of the service line freezing up. The customer should repeat this at least once every two hours for at least five minutes or more to keep the water moving. At night customers should just let the same small stream run continuously through the night until the next morning. The customer will most likely be concerned about the amount of water they will use and what that will cost. It is up to each city as to how they deal with the issue of compensating for the water used. Let’s look at what costs are involved in dealing with this issue. It takes about two to five minutes to fill a one-gallon jug depending on the size of the stream coming from the tap. If we use three minutes as an average, this equals 20 gallons per hour. Even if a customer let the water run for 24 hours straight, that would be 480 gallons a day. If the customer went ten straight days letting the water run that would be 4,800 gallons. Now if the rate being charged is $5.00 per 1,000 gallons of water and $5.00 for that same water for sewer this would equal $48.00. The going rate to have a service line thawed starts at $100 per hour and the process takes from two to three hours on average. Most companies are charging closer to $200 per hour, so it is in the long run more cost efficient and a lot less headache to let the water run. What if the worst happens and the water service lines freeze? First, you need to make certain that it is the water service. If the customer has water in part of their house, like the bathroom, but no service in other parts of the house, like the kitchen, that is an internal plumbing issue and the water service line is not frozen. If the customer has no water in the house system at all, most likely the water service is frozen. There are basically two ways to thaw out a water service line. The first method is the steam/hot water/high-pressure method. This is where a tech uses a very small tube to insert into the water service line at the point where the service line enters the dwelling. The meter is removed in most cases and the service technician pushes this tube to the point where the ice block has manifested and the steam/hot water/high-pressure will erode the ice blockage and allow water to flow freely. Keep in mind that there will be some amount of water coming out of the service line until the blockage is eliminated, because it will have nowhere else to go. Once the blockage is removed the water pressure will return very quickly. The service technician then removes the tube so they can shut the water service valve. Keep in mind that at this point the technician will have an open pipe with full pressure water coming out, so things will get very wet. The second method to discuss is using a welder or generator system. This is where a service technician connects one end of the cable of the system to the water line, most likely to the water service line at the point where it enters the building (the same location as the previous method). Then the technician connects another cable at some point on the outside of the building to the water service line. In most cases, this is done at the curb stop box located in the yard. A curb box valve wrench is inserted into the curb box and lowered down to the curb stop valve to make the connection and then they attach that cable to the wrench. The system is started and the electrical current is passed through the pipe to heat it up and melt the ice blockage contained within the pipe. There are times depending on where the service line is frozen that a connection may need to be made across the street if the water main is on the opposite side of the street and the service line is connected at that location. In those cases, a connection may need to be made at someone else’s curb box or perhaps a fire hydrant in order to get the electrical current to the location it is needed to eliminate the ice blockage. This system can and has worked very well, but it also has many drawbacks and downsides. Only a technician that has experience performing this method should be undertaking this procedure, as dealing with electrical current and water can lead to injuries and even houses being burned down. Most of the time this system works well if done right, but it can also send stray current to appliances and other unintended locations causing damage and risk. Technicians performing this type of procedure are highly encouraged to have the water meter and/or any ground straps removed from the water service line in the house to reduce the chance of stray current. Keep in mind that this current can travel to a house next door and cause the same type of damage as well. It is important to emphasize that the technician doing this work should be experienced in performing these duties and also carry insurance in case something does go wrong. What if the service line to a customer’s house is frozen and the service company cannot get to them for a few days? How do you get water to the customer’s house? One option to consider is hooking a garden hose from the outside hose bib faucet of the nonworking water service house to a house close by (a next door neighbor) that does have working water service to their outside house bib. Keep in mind when you choose to do this that the water must continually run through the hose so the water must remain on in the house that has no water or the hose will freeze up in a very short time. In these cases, some cities may desire to provide some assistance with the water bill in cases like this. This is a decision that each city must make for themselves and the customers they serve. Let’s consider some ideas of how this might be handled with the least amount of effort and confusion for the purposes of billing. In the case of a customer that lets their water run to prevent the service line from freezing, consider charging the customer their average water bill for that month or charge the amount the customer paid the month before. In the case of houses that were hooked together by garden hoses to provide water to a customer that has lost water service, consider charging the average bill or the same as the previous month. Remember that the house providing to the house that has no water service is doing a good deed and providing a needed service to help a neighbor and should not be punished. There is also no method to account for the water flowing to the house that has lost service. Remember that when faced with extremely cold conditions where customers need to keep water running to prevent service lines from freezing, they may also be keeping water mains from freezing as well, especially on low use water mains that may not be as deep as other mains. The goal is to keep the water moving and prevent lines from freezing.